Here are the trays in their original strange splendor. I envisioned it filled with all kinds of goodies for the holidays. Since fall is upon us I decided to decorate it for the season. In retrospect it probably would have been a good idea to add a nail to each candlestick for stability. It's pretty sturdy, but I wont be adding anything heavy to it. Sorry I forgot to take a picture of the candlesticks, but they are those basic unfinished sticks that they sell at the craft store.A few more looks at the vignette. Thanks for stopping by, I'll be joining these parties this week. Great job transforming those fish trays. Looks beautiful. Love how you transformed those stinkers! Can't believe that's what they looked like before, I'll have to remember to give that try myself- so different to not use round plates! Absolutely genius! I love how it turned out. It makes for a beautiful vignette! This is not only "FUN", it is SO USEFUL!!! WOW does that add lots of interest to your setting, WHICH is FABULOUS! Wow, great job, Karen! I love the final outcome. I would have been cursing each coat as the fish showed through! I can absolutely see that decorated with ornaments and beads for the holidays. What a great piece to add to your vignettes. Fabulous is all that I can say! I LOVE what you did with those trays! And I laughed with the "that fish wasn't going anywhere without a fight" comment. Soooooooooo pretty & I LoVE your finished display. Enjoy! How pretty Karen! I love this idea, and your photos are fantastic. Thanks for sharing with my party. Wow, what a transformation! Lots of painting, huh? I really like the end result...and all of the decor is beautiful! I love the trays. You really did a good job with them. I can think of all kinds of uses for one. Thanks for sharing your talent. Absolutely love it! I think I might have kept on walking when I saw those, so good for you for having such great vision! Visiting for Debbie Do's party. These are amazing! I need to go to the thrift stores tomorrow and look for trays for seashells. I love what you did with these! Great idea! Wow....the trays turned out great! I love your vignette. So pretty! Brilliant! Five coats of paint? Aya . . . I think this looks just beautiful! Thanks for sharing. 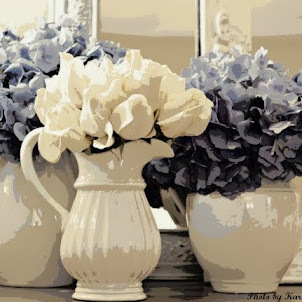 Your burlap wrapped vase and flower arrangement are simply beautiful, as well as the color palette. Fall is the perfect time of year for a nature themed vignette- not to mention Goodwill, paint & patience being the perfect ingredients for fall projects. Great idea and look! That turned out great! I love a tiered display. Totally worth all the effort. I'd love it if you linked up at my weekly party - Mod Mix Monday! I've been looking through your blog. My first time here and am your newest follower. I'm adding you to my blog roll. Great ideas. You are great with glue and paint! Everything is just gorgeous! That was a great idea. The entire display is so lovely. 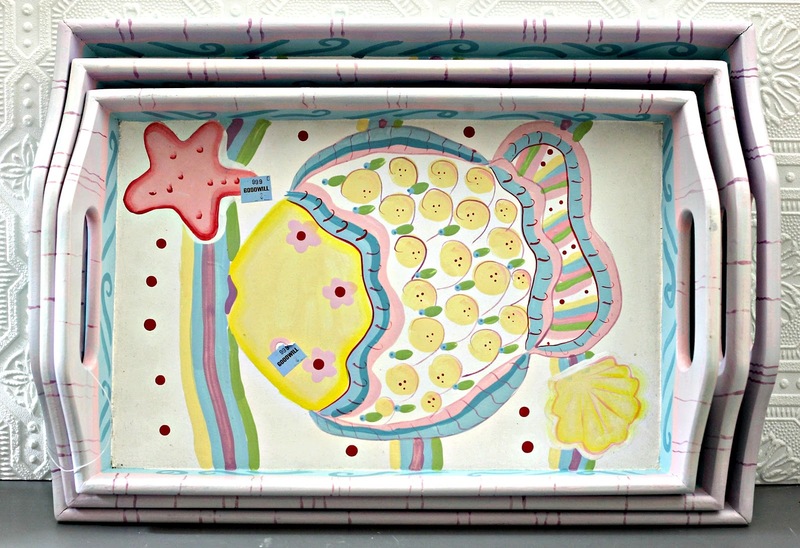 Your vignette is stunning, and what a great idea for transforming your trays. You took something totally gross that I would never buy and made it the envy of everyone at the party. Great job! Thrifty and beautiful! Great job and idea! The stacked trays are fantastic and all the vignette lovely! I love the trays but even more so I think I love how you filled them! The white items are so pretty and the mixture of the other shades is just perfect!! You are a Goodwill stacking GENIUS! That looks amazing, I can't wait to borrow/steal that idea!! Amazing before and after. You have such a special touch and can make something special out of nothing much! Beautiful vignette. Love the look with so much white. Perfect. Such a pretty vignette, Karen--I love the book stacks, and the ribbon that you chose. And what a cool idea for your tray stack with the candleholders--very clever and pretty! What a fabulous idea! Love the arched window, too. Sooo lovely! What a great transformation! I'm your newest follower through GFC. Hello! Found you via My Romantic Home. Love what you have done with this little fall vignette! Pinning a few images to my Autumn Splendor bored. Stop by and see me sometime at my blog. I'm your newest follower! What a great idea transforming those trays, love it! I love what you did with the trays (they definitely cried out for a makeover!). It takes a lot of patience to do that many coats of paint, but it was well worth it. Love how you have made them part of a great vignette. Very pretty! Where did you find that wonderful arched mirror/window? I love it. Your vignettes are lovely; I particularly like the strip of striped burlap (?) under the shoe last. And the tiered trays are an attractive and clever idea. Can't believe I missed this post. Your display is absolutely gorgeous. Beautiful makeover on the trays. Congratulations on your features!!! I just happened across your blog and have been reading several of your posts. Lovely! I especially like your tiered caddy with the trays. I think I may have to borrow your idea. Thank you. I love the fish drawing on the tray. Thank you for this great idea, now if I can only remember where I saw similar trays that I passed up because of the design on them!! I will definitely use this idea for a wedding reception I'm doing! It will work beautifully for the appetizer table~ Thanks.